Purium`s Organic Kamut Blend TM is grown in nutrient-rich, organic soil, watered with mineral springs, and harvested at the peak of nutrition. Kamut® is a superior non-GMO, non-crossbred, nutrient-dense heirloom-seed Egyptian wheatgrass. We have combined it with oat and alfalfa to give it a sweet taste and increase the mineral and trace mineral content. We recommend combining Organic Kamut Blend with our Organic Spirulina. 1 teaspoon of Kamut Wheatgrass powder is equal to 1 oz fresh wheatgrass. Organic Kamut will help rebuild healthy intestinal flora and therefore may have a positive effect on regularity and gas. Green Kamut has traditionally been used to promote regularity and does not cause constipation in most cases. Organic Kamut Blend is a great source of chlorophyll, the most health supporting green food phytochemical. The molecular structure of chlorophyll is similar to that of hemoglobin, the protein that makes human blood red. There are perhaps no two more vital elements working in tandem to benefit the body. Chlorophyll is responsible for the release of oxygen. Hemoglobin captures the oxygen in the lungs and delivers it to the cells. Chlorophyll is known to have enormous benefits as a cleansing, detoxifying, and healing substance. It delivers the necessary nutrients to your cells, neutralizes toxins and gives protection from free radicals. It is a natural detoxifier and helps eliminate toxins from the intestines and other tissues. Because it is a natural detoxifier, it also aids in reducing bad breath. Chlorophyll also acts as an antioxidant and anti-inflammatory. Organic Kamut Blend contains the necessary trace minerals, magnesium, potassium, and chromium. Magnesium activates the enzymes that catalyze reactions between phosphate ions and energy to muscle cells. It is also associated with regulation of body temperature, neuromuscular contraction and synthesis of protein. Potassium is the principle positively charged atom in intracellular fluid and is of primary importance in its maintenance. In conjunction with sodium and chloride, it aids in regulation of osmotic pressure (dissolved fluid absorption into the tissue) and acid-base balance. Chromium, a very hard metallic element, helps regulate metabolism and has recently become the superstar of the weight loss industry. Organic Kamut Blend is an alkaline-forming food that does not artificially destroy the body`s acids, but instead balances them. Organic Kamut Blend also provides protein-completing factors, all of the eight essential amino acids, as well as a number of free form proteins that are reconfigured and used by the body to create lean connective tissue and enhance reproductive functions. Organic Kamut Blend contains enzymes identical to the most powerful and important enzymes manufactured by the body. The function of enzymes as catalysts is undeniable. Since every reaction in the body is triggered by enzymes, those which are taken in by the body as food supplant the need of the body to manufacture it`s own, therefore reducing a form of stress on the body. Kamut seed was discovered in an Egyptian tomb in the late 1930`s. David Sandoval originated Kamut Wheatgrass in 1993 and since then Organic Kamut quickly became recognized as the finest wheatgrass powder available. Chlorophyll containing plants have always been the “source of life” and well being for the planet and humans. To get a healthy supply in your diet you would need to eat many servings of kale, collards, turnips, mustard greens or spinach. In our fast food paced society, many of us do not have time to think about health and nutrition. 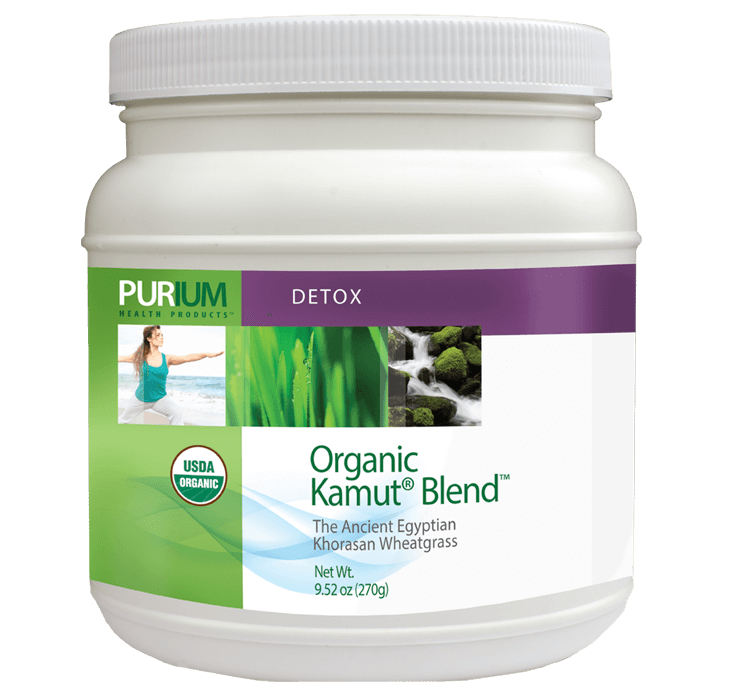 Purium`s Organic Kamut Blend is grown in nutrient-rich, organic soil, watered with mineral springs, and harvested at the peak of nutrition.